Having very kindly been sent a couple of flavours of Myprotein’s new pre workout; MyPre, I put them to the ultimate test….. Leg days! First off we’ll start with the taste. I chose the Sour Apple first and wow does it pack a punch! It immediately reminded me of some super sour but tasty sweets I had as a kid. Well worth a purchase on that front. The second flavour was Watermelon. 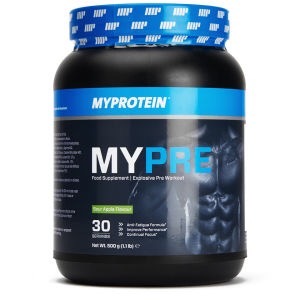 A firm favourite of mine with intra-workout flavours (so Myprotein bring out another favourite of mine; Exceed in this!) Again, the flavour packs a punch, but in a refreshing way, great before and during a workout. I currently use Pulse V4, again from MyProtein and the first big difference apart from the difference in strength of taste, is the serving size. At double the amount of physical powder to the v4 it seemed a tad daunting, but you’re ready for a big hit at least. I’m unsure if it’s because I consumed a physically larger amount of pre-workout due to the above reason, but I certainly did feel a better “kick” and the pump I got during the workout was awesome! A well recommended product, giving a hit equivalent to the “big boys” such as NO-xplode, but with the focus of the less stimulant dependent powders of MusclePharm’s Assault.